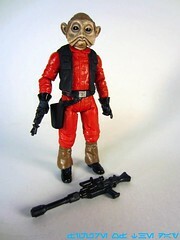 Commentary: I'm super-pumped Hasbro revisited Nien Nunb in late 2012, although it probably wasn't necessary. The 1997 version was pretty good and pretty cheap, but the 2012 version is quite nice. Actually, if the head were painted better I'd say it was an unquestionable improvement. The sculpt was improved greatly, with more detail, a better-looking costume, and (most important of all) the right height. Lando's co-pilot retains the typical 14 points of articulation and raises the figure a holster for his squared-off 1983-style faux-Kenner blaster pistol. (A nice touch!) He has little problem standing or sitting, and fits pretty well in the big Millennium Falcon from 2008. As an added bonus, his longer rifle is modeled after the 1997 figure, so this is as much a nearly-perfect movie figure as it is a nod to his previous toys. The face is a little darker and less glossy than I would have liked, browner than gray and lacking in color around his unique jowls. This just could be a trick of the light in the movie, but I think there's potential here for another redeco should Hasbro opt to reissue this figure for the (I assume) planned rerelease of Return of the Jedi in 3D in 2014. The sculpt, detail, and personality of this figure is great. A+. The deco? B+. It's tantalizingly close to perfection! Collector's Notes: Despite being an online-exclusive, this wave sold out (partially) cheaply on Amazon. They had no patience, in a few days it went from full price to a flux price of about five bucks. I wouldn't suggest paying more than $15 for it if you can help it.